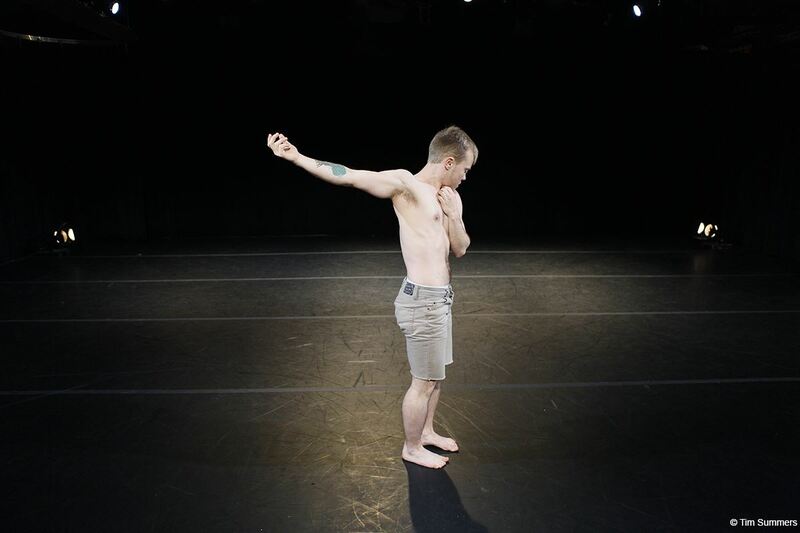 Velocity Dance Center Artistic Director Tonya Lockyer often sets an extra challenge for the artists featured in Velocity’s annual NEXT FEST NW by asking them to create work on a particular theme. This year’s topic was “utopia,” a concept with multiple definitions, so that it can be the perfect place or no place at all. The six choreographers in the program took this ambiguity and ran with it, and the result was a decidedly mixed bill. One of the most charming moments of the evening happened before the lights even went up on the opening work. As Julia Sloane and Juju Kusanagi found their places onstage in the dark we could follow their progress by their glow-in-the-dark hairclips. This skittering energy shifted once the lights came on, as Space Inside ‘No-Place’ takes its time building movement through incremental changes. A long swaying phrase extends into a looping figure-8 arm gesture, giving us plenty of time to mark the subtle differences between the two women. When composer Sierra Klingele plays, using a bow on a hanging sculpture and a pair of gongs, the gradual build and decay of the sound fits into the underlying motor of the work. On top of this groundwork, small hand gestures (scratching and waving) are like the hairclips at the beginning of the program—a whimsical moment that highlights darker things. In The New Masculine, Randy Ford, along with Fausto Rivera, plays with the conventions of gender, mixing aggressive gestures with flirtatious postures, setting up a contrast between a wobbly walk in stiletto heels and judgmental commentary (“can’t say cute…you sound like a girl… fix that”). Their duets have a more indeterminate character, where each one supports the other and is supported in turn, but by the end of the work, they are still at the beginning of their journey. Laura Aschoff’s Before It Gets Worse opens with a truly arresting image. Hanna Hoffman is held captive, her dress pinned to the upstage curtain, and before she can slither out of the garment, she becomes a target, bombarded with pillows and rolls of toilet paper. She escapes, but the rest of her experiences are marked with non sequitur and insecurity: an embrace that isn’t reciprocated, a strange ritual moment where she and Nathan Blackwell break eggs on each other. At the moments that they seem to make a connection, other choices get made, and the world moves on in a different direction. It’s never made clear what he might be counting, but Daniel Costa’s The Next 100 does seem to be a look at the middle of something. 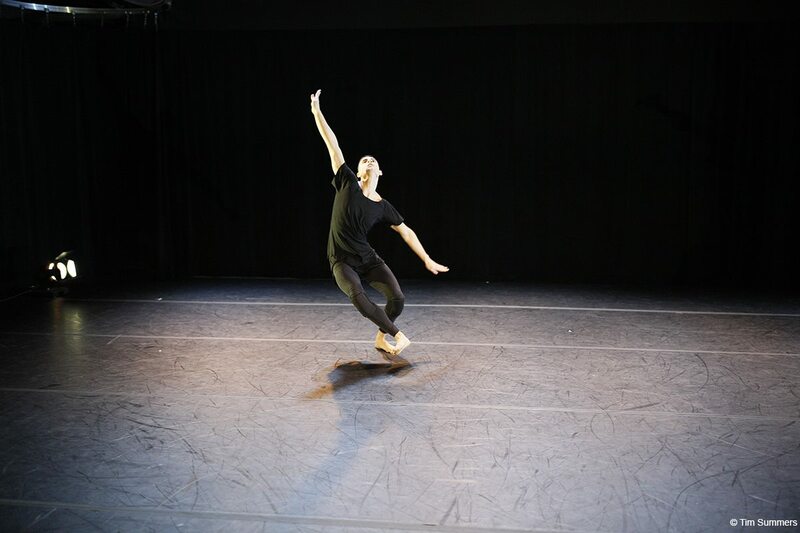 In an extended solo, Costa explores a kind of physical facility that has a classical sense of clarity and articulation without being a variation of ballet-based material. He takes the longest way around in a trip down a diagonal pathway as his spine starts to vibrate and his breathing becomes more intense. When a long arch backwards takes him to the floor it seems that he might be totally spent, but composer Travis Corwin leaves his spot on the side and approaches him with his guitar, almost ritualistically, seeming to heal him with looping chords as the lights fade. Imana Gunawan makes multiple references to her Indonesian heritage in wali panca as she’s designed what looks like a version of a traditional temple ceremony. Her opening sequence, with Randy Ford facing away from us, wearing a deep red skirt that pools on the floor at his feet, sets up a dichotomy between his stillness and a group of women (Cheryl Delostrinos, El Nyberg, Hallie Scott, and Rebecca Smith) buzzing about the stage to the gentle clangor of a gamelan. Their lively energy eventually gets transferred to Ford, who gradually slips out of the skirt. Each dancer got a turn with the costume, transforming it into a cape, a shroud, a shelter. The work could be seen as an affectionate nod to Ruth St. Denis, who used elaborate costumes to help create her faux-ethnic solos, or just a happy coincidence—either way, the two seem to share an appreciation for the effect a truly stunning costume can have. Elby Brosch closed the program with a work of skill and sweetness. Baby, Look Me in the Heart could have traded on pure sentimentality—a view of someone moving from hesitation to strength, danced with great sincerity to a recording of Dolly Parton singing “I Will Always Love You.” Instead, Brosch opens with an ambiguous moment, lip-syncing to a score we cannot really hear. The music becomes more clear as the movement becomes more fluid, showing an easy proficiency, loping across the space. Finally, as the song gets to the chorus the dancing really takes on a bolder dynamic—Brosch and Parton both sending out their message of love. NEXT FEST NW ran at Velocity Dance Center December 11-13, 2015. More information about Velocity and their programs can be found on their website. Knowing Imana Gunawan personally, I believe that it is incorrect and slightly insulting to say that her “wali panca” is in any way a “nod to Ruth St. Denis.” Ruth St. Denis was a pioneer in modern dance and she did incorporate “Eastern ideas” into her work, but she did it through poor appropriation. She used orientalism in her work to romanticize what she found appealing in a culture and did not do any justice to the true history and value of her source. With that being said, just because Ms. Gunawan decided to use a red piece of cloth as a costume choice and an instrumental sound score that happens to be from her culture, her work should not automatically be categorized as something that is “faux-ethnic.” I also want to recognize the fact that if she did draw from her own culture and background to create this piece, she still does not belong in any category or remind anyone of Ruth St. Denis. Being Indonesian, I would expect her to have some valid perspective on her own culture.